A Packer in GTA Vice City. The Packer is a car-carrying vehicle featured in Grand Theft Auto: Vice City, Grand Theft Auto: San Andreas, Grand Theft Auto IV and Grand Theft Auto V. Unlike most vehicles from GTA Vice City, the Packer is absent from Grand Theft Auto: Vice City Stories. 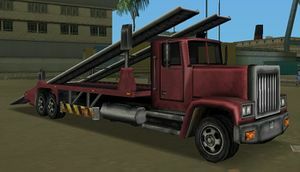 In GTA Vice City, the Packer could not transport vehicles, but in GTA San Andreas it can carry two or three, due to the ability to elevate part of the ramp. However, cars can still roll off at sudden stops or other sudden movements. Cars brushing against the truck can cause the truck to stop unexpectedly. The Packer can also be used as a stunt ramp. It is possible to safely store one car on the Packer in GTA San Andreas, due to its ability to move the upper ramp up and down; this is done by driving it onto the bottom ramp and slowly closing the top ramp down. If the ramp goes go too far down, however, the car will get crushed and explode. The player must have a good touch to keep the car safely in place. The Packer in GTA Vice City and GTA San Andreas bears a resemblance to the 1986 Peterbilt 379 Car Carrier. The Packer is slow and hard to control due to its long body and wheelbase, but it can push small cars away without restraint. GTA San Andreas, with its upper ramp completely raised (Rear quarter view, with ramp lowered.). The Packer in GTA IV has a cab over engine design and is manufactured by MTL. Its short wheelbase makes the truck slightly more maneuverable compared to the previous rendition, but does not make up for its still poor speed (top speed being 110 km/h or 68 mph). In addition to the ramp that was available on previous versions of the Packer, it now comes with flatbed and tanker variations (the tanker's content is unknown). The ramp does not touch the ground so it can't be used for transporting cars or doing stunts; third party trainers can however be used to spawn a variant with a ramp touching the ground, but performing stunts with non-motorcycle vehicles is nearly impossible. It is based on a Kenworth K-100. It can be sold to Stevie for up to $4000. A Packer in GTA IV, equipped with a ramp. A Packer in GTA V, from a leaked TV commercial. A Packer in GTA V.
The special green Packer in the mission Cop Wheels, GTA San Andreas. A unique light green colored Packer appears in the mission Cop Wheels in GTA San Andreas. After collecting all thirty cars for Stevie in GTA IV, he agrees to purchase cars from Niko Bellic, with the Packer fetching $4,000. Usually seen in Ocean Docks and its vicinity. Parked behind a storage building in Spinybed, Las Venturas. The Packer spawns at industrial areas. Parked near the old Sprunk Factory, Niblick Street, Tudor, Alderney. A Packer is seen blocking the road in the ending of the chase between Ivan and Niko in the mission Ivan The Not So Terrible. The player is able to take it, unless its driver drives away in it. Occasionally appears in Gang Wars in The Lost and Damned as a target vehicle to destroy. The truck normally comes with with a ramp or a tanker load.